A cash distribution centre in Tsihombe, Madagascar, where 96 percent of people are food insecure. 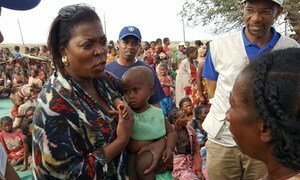 Following a report that more than half of the population in southern Madagascar – 840,000 people – is experiencing alarming rates of food insecurity, United Nations agencies are responding to the most severe cases of malnutrition and acute hunger to prevent a catastrophe. The situation follows a third consecutive year of widespread crop failure and scarcity of water. 92 per cent of the country’s population lives on less than $2 per day and the Integrated Food Security Phase Classification (IPC), a tool to improve food security analysis that has been used in more than 25 countries, found that food security and nutrition could deteriorate further unless there is a rapid humanitarian response. Many families are now begging, selling land or possessions, and eating vital seed stocks just to survive. Parents are taking children out of school so that they may look for income, food, wood and water. According to Leila Gharagozloo-Pakkala, Regional Director for Eastern and Southern Africa for the UN Children’s Fund (UNICEF), nearly half of the children in Madagascar are chronically malnourished or stunted. “Stunting,” she says, “risks condemning children to lifelong poor health and increased poverty.” She added that children in the southern part of the country are already suffering from acute malnutrition. “The cost of inaction or further delaying our response is too ghastly to contemplate,” said David Phiri, the Subregional Coordinator for Southern Africa of the Food and Agriculture Organization (FAO). According to Mr. Phiri, food stocks from the last harvest, which was also poor, ran out in August. The next harvest will not be until March of next year. He estimates that if efforts are not scaled up now, the people of Madagascar will suffer hunger for another year. “This would be a catastrophe for a people who already appear to have virtually no food, no seeds and no discernible income,” he warned. WFP, FAO, and UNICEF are expanding their commitments and resources as quickly as possible. WFP will augment its ongoing food and cash relief operations in order to meet one million vulnerable people by the end of November. It is expanding its nutrition programme to prevent and treat moderate acute malnutrition (MAM) for more than 200,000 pregnant women, nursing mothers, and children under the age of five. It will also provide hot meals to some 230,000 school children in the southern area of the country in order to encourage families to keep children in school. Meanwhile, UNICEF is preparing water and sanitation operations to reach an additional 850,000 people. It will offer monthly nutrition screenings for children under five and treat those with severe acute malnutrition (SAM), offer health interventions for those living far away from local centres, and education for 200,000 children to help avoid school drop-outs, child labour, and child marriage – common coping mechanisms under extreme situations such as these. FAO efforts include assistance for 850,000 people in districts that have been most affected by the crisis. Such assistance includes providing quick-maturing and drought-tolerant seeds and root crops, as well as tools for farmers to replace those that have been lost. The agency will also help feed livestock and ensure animal health. In order to effectively support the people in Madagascar and avoid a catastrophe, WFP requires an additional $89 million in funding, UNICEF will need $36.5 million, and FAO is short of its financial needs by $18.5 million. Annan calls for peaceful resolution to Madagascar political crisis.